Who doesn’t love Tacos?!?! I can tell you that I sure do. I kid you not, my family ordered Mexican food for three Christmases in a row. …mmmMMmmm, Chips and Quesoooo… To satisfy this taco romance, I created this healthy and simple spin on that holiday take-out! I grew up a multi-sport athlete where diet wasn’t something I ever had to consider. Then, I got to college and was dealing with a severe injury that decreased my activity level and had a huge impact on my life. My go-to foods were Nutella sandwiches, chocolate croissants, and dozens of cookies. I routinely baked a Funfetti cake and eat it all in one sitting. The next day, I baked another! Clearly, I have a major sweet tooth and I’m a chocoholic. It wasn’t until college that I realized a dozen chocolate chip cookies from the cafeteria wasn’t ideal. Suddenly, the freshman 15 appeared, and that was when I discovered the Paleo diet. Paleo has not only made me healthier, but also became a fun hobby! I have always loved cooking and when I substituted healthy ingredients to make my favorite foods, it gave me a challenge I was always excited to take on. With Paleo, not only did I start feeding my body the nutrients it needed, especially as an athlete, but it also cut back my caloric intake, resulting in lean muscle and a loss of 10 lbs of fat. To me, Paleo isn’t a diet but a healthy lifestyle. It twisted my taste buds into craving real, wholesome foods while also keeping my body healthy and fueled. I also had the ability to eat more volume of whole foods!! Now when I try processed foods, they actually taste like chemicals. Now for the recipe! 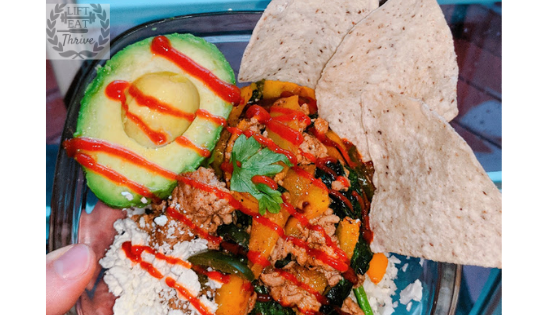 This Paleo Taco Bowl is my go-to lunch prep because of how simple it is to make! Not only that, but it contains your protein, vegetables, carbohydrates, and fats needed to fuel you for the day! At the final 2 minutes of cooking the ground turkey/beef, throw in the 3 cups of spinach until fully cooked and mixed. Be sure to add the spinach1 cup at a time since it has a lot of volume and will overflow the pan. Mix in ½ cup cilantro and save some for garnish. Add ½ avocado, Sriracha (to your liking of spiciness), and cilantro for garnish.